Are pixies real? Check out these drawings of pixies and you just might find yourself believing in them. Compared to their surroundings they are so tiny and we probably wouldn't see one even if we were actively looking for it. When you do your pixie drawings, keep in mind that their size is miniature and you need to draw to proportion. 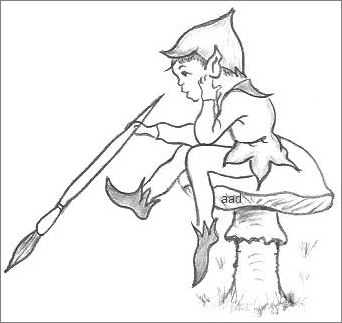 Please have a go at copying the easy outline of this pixie drawing here. You need to start with simple pictures first and then once that is mastered, you are able go on and confidently copy other sketches. 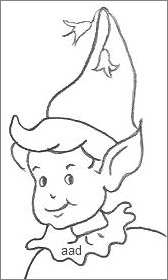 A pixie, or pixy, is said to be a fairy or an elf. Everybody knows that both of those are mischievous sprites. This is an artistic pixie, painting nature to while away some time. According to folklore, pixies originated in England. They are good looking little people with pointed ears. Pixies are commonly seen in green outfits with a pointed hat. They don't have wings like fairies do, so they can't fly but they skip and flit about quickly. They love to dance in the shadows and ride on insects. Pixies are said to leave a pixie dust in their wake. In the drawing below, can you see the dust falling to the ground? When he jumps down, he'll no doubt leave footprints behind. Pixies can lead you astray so never follow one even if they beckon you to do so! If you do happen to follow one and you get lost, turn a piece of your clothing inside out and that will break the spell. Like fairies, pixies can perform good or bad deeds. If you are worried about upsetting them you can leave out small bowls of milk to gain their respect (and stay in their good books!). I hope these drawings of pixies are what you are seeking for some practice or for craft projects. The sketches are fairly plain so you can draw in lots of detail. This pixie looks big compared to the mushroom. Oops, maybe I've made a mistake there. 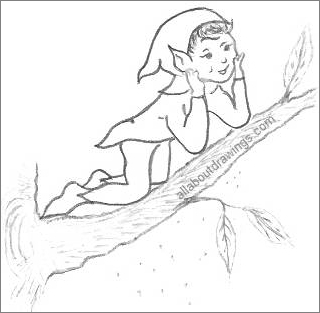 If I was to portray him correctly, the pixie would really be leaning on the trunk of the mushroom. Let's pretend it's a very small mushroom! When we start to teach ourselves how to draw, we really benefit the most by practicing simple drawings. You'll discover that your friends will love looking through your sketchbook -- even at your practice pages because they're not game to try it for themselves. Learning to draw is possible for all people of all ages, you only need the willingness to have a go and your confidence automatically grows from that point onwards. 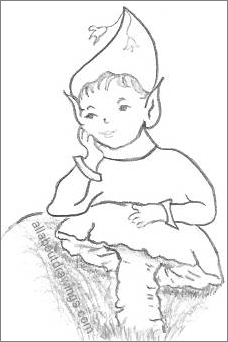 These pixie drawings were fun to do - they were created only one year into my drawing experience. I am looking forward to creating some drawings of pixies in color but that is something for me to anticipate at this stage. My first focus is on learning to draw with pencil because that is the easiest medium. I must go and keep my eyes peeled for some pixie dust! If you continuously wish you could draw, please find a pencil and try copying an easy drawing because you'll soon see that it really is achievable. Start drawing today, you're gonna love it!